Sheriff Louis Falco announced the retirement of K9 Shadow last week. Due to a medical condition, K9 Shadow will retire at the age of nine, having served the RCSO and the citizens of Rockland for over seven years. K9 Shadow had been partnered with Sgt Christopher Ford and will continue to live with Sgt Ford and his family. In 2011, Sheriff Louis Falco, started the Sheriff’s Office first Patrol K9 Team with K9 Shadow. This first K9 Team was established with the use of asset forfeiture money for the purpose of reducing contraband at the Rockland County Correctional Facility. A graduate of the Orange County Sheriff’s Office Patrol/Narcotics School, K9 Shadow was trained in tracking, evidence recovery criminal apprehension, handler protection and narcotic detection. The Sheriff’s Office thanks K9 Shadow for his service and wishes him an enjoyable retirement! 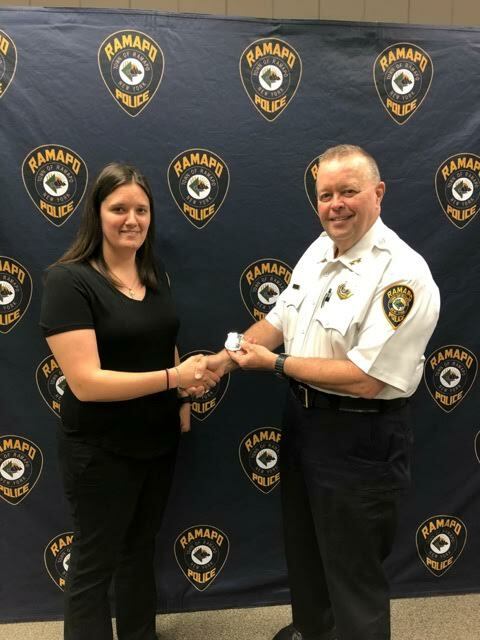 Ramapo Police Dispatcher Dayna Stevens will be assigned to Ramapo PD’s Emergency Communications Center where she will be trained to handle incoming emergency and 911 phone calls. She will also be responsible for ensuring that the right emergency personnel and equipment is dispatched to those in need. Here are photos of Disp. Stevens receiving her shield from Chief Weidel along with Communications Sergeant Anthony Giardina. The members of Ramapo PD congratulated Det. Greg Whalen on his retirement this week. Det. Whalen began his 31 year law enforcement career in July of 1987 with the NYPD. He was appointed to RPD in January of 1995. Det. 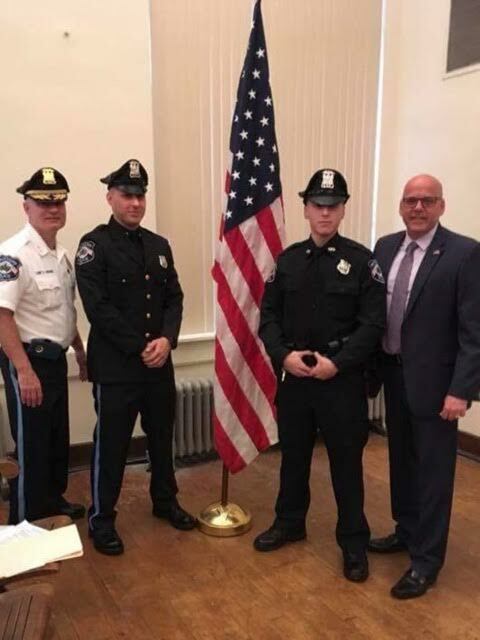 Whalen served the Town of Ramapo in various capacities, including Police Officer, Community Police Officer, Detective and was assigned to the Rockland County District Attorney’s Office Special Investigations Unit. Det. Whalen served as President and other leadership positions in the Ramapo Police Benevolent Association (PBA) for many years throughout his career. 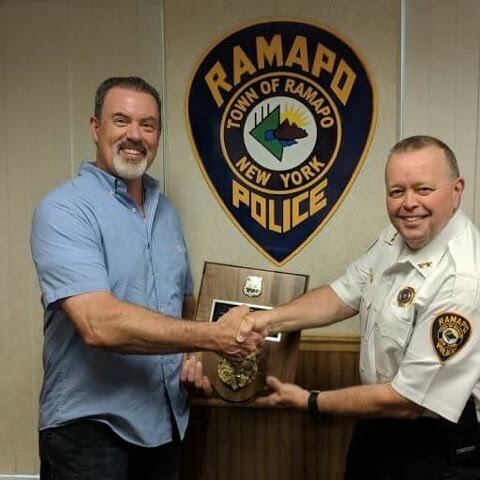 On Tuesday, Ramapo PD congratulated recently retired PO Morgan Tighe on his 32-years in law enforcement. Tighe started his career with the NYPD in 1986 before his appointment in Ramapo in 1989. He served in many capacities over the course of his career. On Monday night Suffern PD formally swore in PO Nick Careswell as a full time police officer. Careswell is a Village of Suffern resident and veteran of the United States Army’s 69th Infantry Regiment. In photo, left to right, Chief Clarke Osborn, P.O. Mike Careswell (Nick’s brother), Nick Careswell and Mayor Ed Markunas. Welcome aboard Nick! Have a good night my friends.